In the late 1980s NASA began to consider replacing its previous neutral-buoyancy training facility, the Weightless Environment Training Facility (WETF). The WETF, located at Johnson Space Center, had been successfully used to train astronauts for numerous missions, but its pool was too small to hold useful mock-ups of space station components of the sorts intended for the mooted Space Station Freedom, or its successor, the International Space Station. This new pool was going to be on Johnson Space Center property and was planned to be 72 meters (235 ft) by 41 meters (135 ft), with a depth of 18 meters (60 ft). To save money it was downsized and placed inside an existing structure. NASA purchased the structure that now holds the NBL from McDonnell Douglas in the early 1990s and began refitting it as a neutral-buoyancy training center in 1995. The diving tank is 202 feet (62 m) in length, 102 feet (31 m) wide, and 40 feet 6 inches (12.34 m) deep, and contains 6.2 million gallons (23.5 million litres) of water. The NBL contains full-scale mock-ups of International Space Station (ISS) modules and payloads, as well as visiting vehicles such as the Japan Aerospace Exploration Agency (JAXA) HTV, the European Space Agency ATV, the SpaceX Dragon, and the Orbital Sciences Corporation Cygnus. Full-scale mock-ups of equipment such as the Space Shuttle payload bay and Hubble Space Telescope have been removed, as they are no longer needed for training. 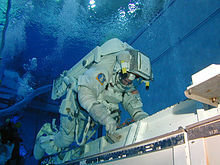 During training exercises, neutral-buoyancy diving is used to simulate the weightlessness of space travel. To achieve this effect, suited astronauts or pieces of equipment are lowered into the pool using an overhead crane and then weighted in the water by support divers so that they experience minimal buoyant force and minimal rotational moment about their center of mass. The suits worn by trainees in the NBL are down-rated from fully flight-rated EMU suits like those in use on the Space Shuttle and International Space Station. Divers breathe nitrox while working in the tank. One disadvantage of neutral-buoyancy diving as a simulation of microgravity is the significant amount of drag created by the water. This makes it difficult to set an object in motion, and difficult to keep it in motion. It also makes it easier to keep the object stationary. This effect is the opposite of what is experienced in space, where it is easy to set an object in motion, but very difficult to keep it still. Generally, drag effects are minimized by doing tasks slowly in the water. Another downside of neutral buoyancy simulation is that astronauts are not weightless within their suits, meaning that as divers tilt their suits they are pressed against whatever inside surface is facing down. This can be uncomfortable in certain orientations, such as heads-down. Thus, precise suit sizing is critical. ^ "NBL Timeline". Neutral Buoyancy Laboratory. Archived from the original on 2 April 2015. Retrieved 20 March 2015. ^ a b Strauss, S (July 2008). "Space medicine at the NASA-JSC, neutral buoyancy laboratory". Aviation, Space, and Environmental Medicine. 79 (7): 732–3. PMID 18619137. ^ Hutchinson, Lee (4 March 2013). "Swimming with spacemen: training for spacewalks at NASA's giant pool". Ars Technica. Retrieved 24 March 2015. ^ a b Strauss S, Krog RL, Feiveson AH (May 2005). "Extravehicular mobility unit training and astronaut injuries". Aviat Space Environ Med. 76 (5): 469–74. PMID 15892545. Retrieved 2008-08-27. ^ Pendergast D, Mollendorf J, Zamparo P, Termin A, Bushnell D, Paschke D (2005). "The influence of drag on human locomotion in water". Undersea Hyperb Med. 32 (1): 45–57. PMID 15796314. Retrieved 2008-08-27.